The Southern California pyschedelic/garage/lounge/worldbeat band Dengue Fever, which just released its third album, Venus on Earth, isn’t just a fun band with a unique sound, retro and innovative at the same time. Consider the band’s origins. The members got together in 2001, when keyboardist (the group’s Farfisa organist) Ethan Holtzman returned to Long Beach after a trip to Cambodia. There he’d been inspired by hissy old cassette tapes of Cambodian rock from the late ’60s and early ’70s. A sweet, urgent, sometimes shamelessly cheesy brand of rock flourished in Cambodia during its years of civil war — music greatly influenced by American and British rock and soul of the time but sung in the Khmer language. Could something like that happen here? Imagine if our country was overtaken by extreme factions of the religious right or, less likely, ultra-PC leftist idiots. Imagine Bob Dylan, Willie Nelson, Sonic Youth, Prince, Harry Connick Jr., Aretha Franklin, “Weird Al” Yankovic, the Drive-By Truckers, New Mexico Music Commissioner Tony Orlando, Britney Spears, and all the rest either executed for subversive thinking and sinful, decadent lifestyles or forced into labor camps. Imagine all their master tapes destroyed, radio stations taken over by the government, record stores burned, and the computer servers at iTunes beaten into scrap. You’ll take my iPod when you pry it from my cold, dead hand! It can’t happen here. Keep telling yourself that. It can’t happen here. Back to the present: So Ethan Holtzman got together with his brother, guitarist Zac Holtzman, and other local Southern California musicians to re-create and update the Cambodian rock sound (mixed with other influences like Ethiopian jazz, The Ventures, Funkadelic, and the Swingin’ ’60s Brazilian band Os Mutantes). Searching for a singer fluent in Khmer, they came upon Dragon House, a nightclub in Long Beach’s Little Phnom Penh where Nimolo, a member of a musical family famous in her native land, had a steady gig. Nimol, who was born about the same time the Khmer Rouge was toppled by the invading Vietnamese, had only moved to the U.S. about a year before. 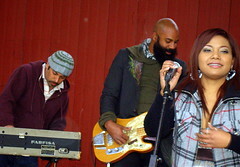 Dengue Fever made a big splash with its excellent second album, Escape From Dragon House, and in 2005 became the first rock band from the West to play in Cambodia since the rule of the Khmer Rouge. That trip is the subject of Sleepwalking Through the Mekong, a documentary just starting to hit the festival circuit. Spin magazine called it “dancing on Pol Pot’s grave.” Wouldn’t it be cool if the Cambodian kids who heard these crazy sounds went off and started their own rock ’n roll bands? Then a surprise. In the bouncy “Tiger Phone Card,” Nimol duets in English with Zac Holtzman: “You live in Phnom Penh/You live in New York City.” Later, there’s “Sober Driver,” another English-language duet that is almost as irresistible. Some have complained that Nimol singing in English strips away some of the mystery of Dengue Fever. Maybe it’s a conscious move to attract more listeners. I don’t care, I like it, though I’m not so fond of “Tooth and Nail,” a soft, mushy ballad that Nimol sings in English. But I bet I would have liked it more had David Ralicke played his usual sax instead of flute on it. One of my favorites is “Oceans of Venus,” an instrumental that has roots in spy-movie soundtracks. Sax/brassman Ralicke, who has played with Ozomatli and Beck, really shines here. And they save one of their best for last, with the cool rocking “Mr. Orange,” which sports a mod à go-go beat and some fuzzy guitar. Just by being what they are, Dengue Fever represents hope in a brutal world. But in the end, what they are is just a good, fun, imaginative band. 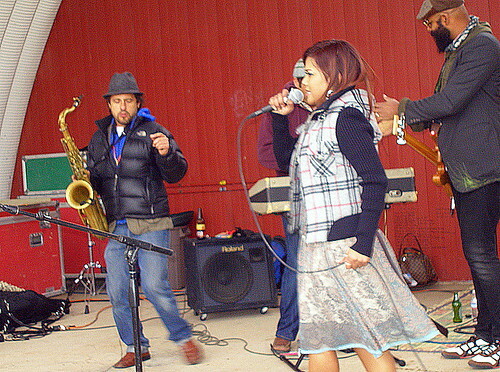 Catch Dengue Fever and other Cambodian rock on Terrell’s Sound World, Sunday night on KSFR-FM 101.1. The show begins at 10 p.m., and the Dengue Fever section starts at 11 p.m. And don’t forget the good old Santa Fe Opry, 10 p.m. Fridays on KSFR (though the lovely Laurell Reynolds is subbing for me this week on the Opry). SPECIAL SESSION DECISION BY FRIDAY? ROUNDHOUSE ROUND-UP: NM VOTES. WHAT'S IT TO YOU?